The Wood Butchers Guide to Technology: I Procrastinate - or do I ? I Procrastinate - or do I ? I sometimes wonder how many diaries/ organisers/ calendars/ task managers one can use. There seems to be a zillion of them on the market - often repeating many operations that the last or rival program offered. But occasionally a little gem comes along that hits the mark. I was prowling the app store the other day. Something I rarely do (there lies madness !). I don't even have it in my dock - that's how often I go there ! 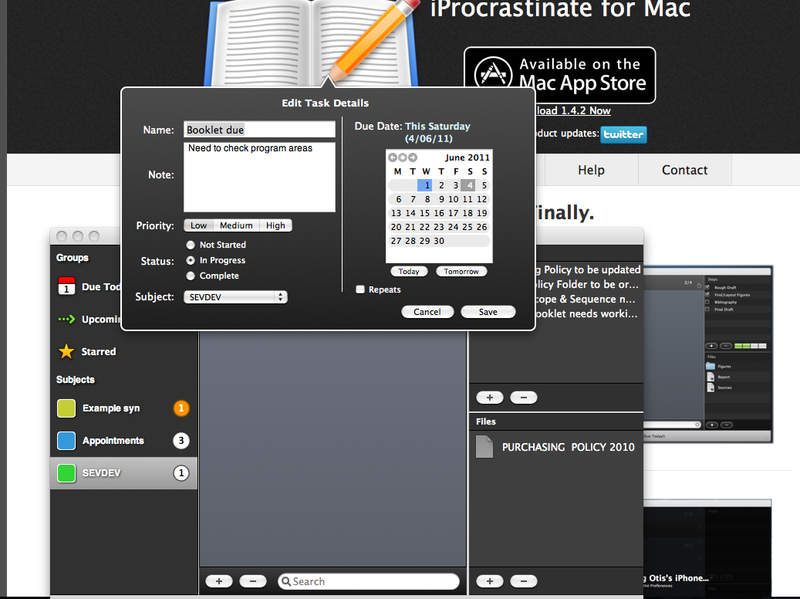 I came across this little program called "iProcrastinate". The title caught my eye. I am the biggest procrastinator I know. My house is never so clean as when I need to finish (or start) some project. Does this sound familiar ? When you need to settle to a task - you just notice how the photos hanging on the wall need a dust or that kitchen cupboard needs a clean out ! It really can't wait - it needs to be done now ! So ___ the name appealed to me. Better still - it was free. The generosity of some people never ceases to amaze me. Some of the programs I find most useful are given for nothing by people who obviously slave away for hours trying to make it work. What does iProcrastinate do ? 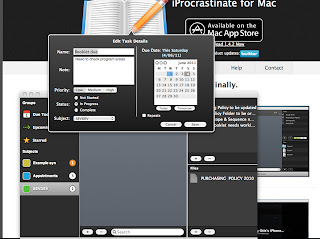 iProcrastinate is a fairly simple task manager that syncs wirelessly with your iphone or through Dropbox over the internet. It was the connection with Dropbox that caught my attention. To me, Dropbox is the Queens Bees of cloud computing. I love it. I operate both Mobile Me and Dropbox. I prefer Dropbox for my day to day files. It is quicker, can be used with any platform and operates like a normal hard drive. Mobile Me I use to host a web site, mail and a calendar. Enter iProcrastinate. It doesn't replace either - but it does fill a gap. If you have a task or project to work on. You can list the tasks you need to do, link them with a calendar, attach any necessary files, have a check list of whether they have been done or need doing as well as sync them with Dropbox. Very handy if you are working on a project at home but want to see a checklist at work or on your iphone. You need to have the app on both computers (or iphone). Working at home - you sync to Dropbox. At work -assuming you have both Dropbox and iProcrastinate loaded, click on your Dropbox file and it updates your tasks on iProcrastinate at work. There are a thousand and one uses you will find for this handy little program. I have just given you one example. I am thinking of the education sphere - but because of it's link with the iphone (which I don't have) I could see the use for travelling business men as fantastic. Give it a go. From mac to mac I have found it really handy (wish they would make an ipad version - but considering it's free I can't complain). Maybe there is no further reason to procrastinate with this handy tool ! Or is there ?